I live right in the center of Rotterdam, which has plenty of upsides, like having lots of shops and restaurants nearby, and being able to walk almost everywhere. But I do find that the center misses some character and personality. Luckily, when you wander outside the center, you will find that Rotterdam has plenty of areas that burst with character and personality, one of those areas being ‘Het Oude Noorden’ (The Old North). This part of town is full of bars and restaurants, and here you will find a real eclectic mix of inhabitants. I would not mind living here myself! 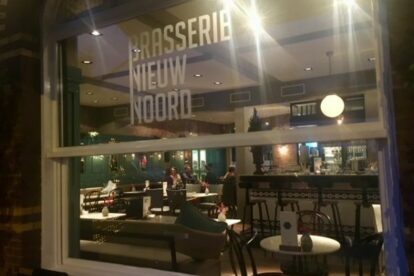 If I ever end up living in Het Oude Noorden, I hope it will be somewhere near Brasserie Nieuw Noord, one of the newer additions to the area. This brasserie opened about a year ago after a thorough renovation and has created a beautiful interior full of nice colors and French/Parisian accents. The menu offers lots of tasty, classical options for breakfast, lunch and dinner. It is the type of place where you come in on a Sunday morning for coffee and a late breakfast and end up having wine and dinner hours later. The atmosphere and character of the brasserie also makes it open for anyone who wants to walk in for a drink or snack, making it an ideal living-room kind of spot!